If there was a tense mood in the meeting between Prime Minister Justin Trudeau and Ontario Premier Doug Ford, it wasn’t on display as the two men left their a downtown Montreal hotel. Trudeau left via the basement level, walking out of the elevator sharing a laugh with Intergovernmental Affairs Minister Dominic Leblanc. Ford left by a different door but arrived a few minutes later at a different hotel smiling and shaking hands as he met with two like minded premiers. “We need a constructive dialogue with the prime minister. 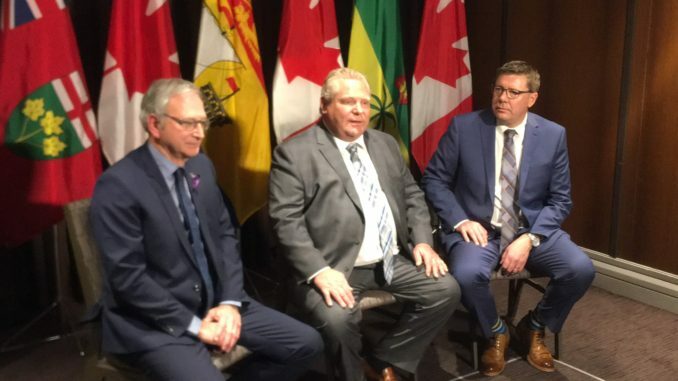 We want to make sure the agenda is exactly what we want to talk about,” Ford said as he sat down with Saskatchewan’s Scott Moe and New Brunswick’s Blaine Higgs. Ford was joined in that sentiment by Moe and Higgs. “In our case we’ll be looking for a repeal of Bill C-69 and some initiatives ensuring provinces can move ahead with their own carbon plan,” Moe said. Higgs, the most recently elected premier who just launched a carbon tax challenge himself, also bemoaned that the issues raised by the provinces were kept off of the agenda for the meeting with the prime minister. “I was very excited by what I saw as a lot of common interests,” Higgs said of conversations with premiers across the country. Ford’s office had suggested the premier of Canada’s largest province may walk away from the First Ministers Meeting if the agenda was not changed. So far the agenda remains the same and Ford remains in Montreal. Premiers objected to Trudeau’s proposed agenda on several fronts but it could be summed up best as not wanting to be lectured to. The proposal was for a brief session of introductory greetings before proceeding to a half hour update on the new NAFTA deal from Canada’s ambassador to the United States, David McNaughton. Then the 13 ministers representing every province and territory were being asked to sit through more than 2 ½ hours of what amounts to Trudeau’s ministers giving Ted Talks on broad themes. Finance Minister Bill Morneau on competitiveness. Environment Minister Catherine McKenna on clean energy initiatives. Dominic Leblanc on increased economic collaboration. From there premiers would get 15 minutes to talk, then an hour long round table involving everyone, including other groups like First Nations leaders that are invited. The premiers had sent a revised agenda that would see Morneau, McKenna and Leblanc attend but not speak. In place of the Ted Talks, discussions of issues such as the oil crisis, Bill C-69, auto sector jobs and cannabis supply among others. Quebec would also like to talk about the border and getting paid for the hundreds of millions spent on social services and education. Ontario, which claims to have spent more than $200 million on that same file backs Quebec. The PMO rejected all of those ideas and simply added some time in Morneau’s Ted Talk for some comments from him, but not the premiers affected about the oil crisis. This is Trudeau’s cooperative federalism. Sit down and listen to what I say. It’s funny that this happened just days after Trudeau appeared before a meeting of the Assembly of First Nations and apologized for not conducting true consultations on the Trans Mountain Pipeline expansion. Now he is before the premiers refusing to listen. There is still a chance that this meeting could blow up, a big part of that will be how Trudeau handles this. Premiers across the country and across political lines want to discuss their issues. If Trudeau follows in his father’s footsteps, and his own instincts of late, and tries to ram through his will, then watch for this meeting to explode.